For other uses, see Annex (disambiguation). Bordering the University of Toronto, the Annex has long been a student quarter and is also home to many fraternity housing and members of the university's faculty. Its residents are predominantly English-speaking and well-educated. According to Canada 2011 Census, the neighbourhood has an average income of $66,742.67, significantly above the average income in the Toronto census metropolitan area. The Annex is not known for its big population of immigrants: in 2011, Statistics Canada declared that there were about 4,665 immigrants - predominantly from the United Kingdom and the United States - living in the area. As of the Canada 2016 Census, the three census tracts that compose the Annex have a total population of 16,834 and an average population density of 11,450 people/km². The Annex is mainly residential, where streets are lined with huge trees dwarfing the massive Victorian and Edwardian homes and mansions, most of them built between 1880 and the early 1900s. The 1950s and 1960s saw the replacement of some homes and mansions with mid-rise and a handful of high-rise apartment buildings in the International style. These were surrounded with landscaped green spaces in an attempt to better fit into the neighbourhood. But thanks to the Government freeze of development in 1975 for any buildings higher than 45 feet, most of the homes have been unscathed. The area is home to a cluster of homes built in the late-19th century. There are now over 500 buildings in the Annex protected by the Historical Board of Toronto, so developers have less chance of maximizing their ventures by tearing down old mansions and developing low rises and townhouse complexes. Some of architect Uno Prii's most expressive, sculptural apartment buildings are located in the Annex. Because of its proximity to the university, the Annex has a high rate of seasonal tenant turnover, and its residents range from university students to older long-time residents. The stretch of Bloor Street, between Avenue Road and Bathurst Street, is a vibrant social and mixed-use area offering a wide range of services from moderate-priced dining to independent discount retailers, in buildings which often include residential space in upper floors. Just west of the Annex proper, along Bloor Street (between Bathurst Street and Christie Street), there are street signs that post Koreatown due to the high percentage of Korean owned businesses (although that neighbourhood is officially called Seaton Village), but many locals refer to the area as "West Annex" (even though the official West Annex area is bound by Bloor, Bathurst, CP Railway, and Spadina). During the 1950s and 1960s, an influx of Hungarian immigrants moved into the neighbourhood after the 1956 Hungarian Revolution was suppressed, and some of the businesses and properties along Bloor may still be owned by Hungarian-Canadian families. The University of Toronto's Robert Brown House. The House is an example of an Annex style home, an architecture style common throughout The Annex. The original conception is attributed to E.J. Lennox, the most prominent architect in late nineteenth century Toronto. His 1887 design for the home of contractor Lewis Lukes at 37 Madison Avenue introduced a design that would be imitated and modified for the next two decades. The Annex style house borrows elements from both the American Richardson Romanesque and the British Queen Anne Style. Annex style houses typically feature large rounded Romanesque arches along with Queen Anne style decorative items such as turrets. Attics are emphasized in the exterior architecture. The houses are most often made of brick, though some also incorporate Credit Valley sandstone. Built for many of the city's wealthiest citizens, the houses are also large. As the wealthy moved away from the neighborhood, many of the houses were thus subdivided into apartments. Seaton Village or the 'West Annex' is west of Bathurst Street and includes the Koreatown shopping district at its southern border. While Seaton Village shares several characteristics with The Annex (notably its architecture and its popularity with University of Toronto students), it is generally quieter, more family-oriented, and has smaller, less expensive homes. Popular Annex restaurants include Puck'n Wings, Fanny Chadwick's, Sushi on Bloor, Sushi Couture and Greg's Ice Cream which is often busy during summers. El Furniture restaurant is popular among students because everything on its menu is offered for $5. Night time spots include The Labyrinth Lounge on Brunswick and The Dance Cave above Lee's Palace. Timothy Eaton with his son, John Craig Eaton. Many members of the Eaton family formerly lived in The Annex. Admiral Road in the Annex is home to the Canadian writer Margaret Atwood, as well as John Ralston Saul and his wife, the former Governor General of Canada Adrienne Clarkson. Her ex-husband Stephen Clarkson lived on nearby Lowther Avenue across from former MP Belinda Stronach. David Suzuki lived for years on Bernard Avenue. Catherine O'Hara lived in the Annex for several years. Explorer Norman Elder owned 'The Norman Elder Museum' at 140 Bedford Road. The noted urban theorist and activist Jane Jacobs lived at 69 Albany Avenue for 37 years until her death in April 2006. CBC writer, producer and actor Ken Finkleman and members of the rock band Sloan also reside in the neighbourhood. Major League Baseball All Star outfielder Goody Rosen lived in the Annex. The Annex is well served by public transit, including four Toronto Transit Commission (TTC) subway stations: Bathurst, Dupont, St. George, and Spadina. Spadina and St.George stations act as interchange stations, allowing passengers both north-west subway travel as well as east-west. Streetcar services run south from Bathurst and Spadina stations. Bus service operates on Avenue Road, Spadina Road, Dupont Street, Davenport Street, and northward on Bathurst Street. 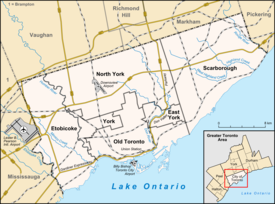 ^ "Toronto Neighbourhoods Net Boundaries". TorontoNeighbourhoods.Net. ^ "The Annex Neighbourhood profile". City of Toronto. ^ Ley, David (1996). The New Middle Class and the Remaking of the Central City. Oxford University Press. p. 182. ISBN 0-19-823292-6. ^ "5350091.01 [Census tract], Ontario and Toronto [Census metropolitan area], Ontario (table)". Retrieved 2018-02-22. ^ "5350091.02 [Census tract], Ontario and Toronto [Census metropolitan area], Ontario (table)". Retrieved 2018-02-22. ^ "5350092.00 [Census tract], Ontario and Toronto [Census metropolitan area], Ontario (table)". Retrieved 2018-02-22. ^ Bielski, Zosia. "Home on the strange: odd abodes celebrated" Archived 2015-10-18 at the Wayback Machine, National Post, 12 August 2006. Retrieved 28 January 2008. ^ "Things To Do in The Annex". Toronto.com. Archived from the original on 2014-09-14. Retrieved 2016-02-02. ^ "Annex history". TorontoNeighbourhoods.Net. Retrieved September 4, 2010. Wikimedia Commons has media related to The Annex.